Qualcomm's new chip to supercharge smart speaker performance | What Hi-Fi? In recent years, technological evolution has ushered in a new age of smart (i.e. voice-controlled) products. Today, voice commands can control numerous consumer electronic devices, including wireless speakers like the Amazon Echo and Google Home, and home cinema products such as the Sonos Beam soundbar and select Yamaha AV receivers. The 'smart' hysteria doesn't look to be going anywhere in a hurry, and Qualcomm's latest announcement is all for its evolution. The chipmaker has announced an all-new QCS400 chipset designed to improve both the sonic performance and user experience of future smart products that use it. We’ve all had to exasperatingly ask Amazon’s Alexa or Google’s Assistant to do something for the second or third time - whether that be due to background noise or flaky network. Qualcomm says its new chip gives smart product manufacturers the opportunity to improve the stability and accuracy of the voice control experience. Compared to its previous-gen chip, it allows more accurate recognition of wake words, faster response times, and improved voice detection during high-volume playback or in loud environments. 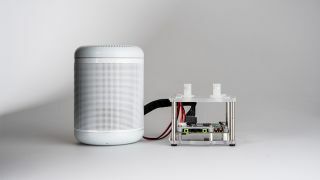 The QCS400 chip also supports ‘local’ voice control, making it possible for smart speakers to respond even when they aren’t connected to the internet. And improved power efficiency of mains-powered speakers and extended battery life of portable speakers is also on the cards, too. Invariably, Qualcomm hasn't focused all on the 'smart' aspect and forgotten about the audio part - which is just as well considering sonic performance is where, in our experience, smart speakers can often let themselves down. With the goal of enhancing sound, the chip’s quad-core processor and dedicated audio DSP supports up to 32 channels of audio, as well as Dolby Atmos and DTS:X formats for smart home cinema soundbars. Naturally, the platform also supports Qualcomm’s latest DDFA amplifier technology and aptX Bluetooth audio (including the 2018-launched aptX Adaptive for improved low-latency and better synchronicity when streaming throughout the home). For display-orientated devices, such as the Echo Spot, the QCS400 series chips also incorporate Qualcomm's Adreno graphics processor. If it lives up to its promise and – crucially – is adopted by smart device manufacturers who pair it with decent driver hardware, this new chip could help give rise to a wave of smart audio that a) sounds better, and b) is that much more seamless to use.